This fine, mediaeval town church is one of "England's Thousand Best". Town Eucharist (with choir), each Sunday at 10:30am (coffee afterwards). Family Eucharist on 3rd Sunday. Prayer Book communion service 8:00am on the 1st, 3rd (and 5th) Sundays. Sunday School & Mothers Union. Wheelchair Access and W.C available. Theres a brand new guide to the Town Church : Clare Town Church: a guide available, selling for £2.00, in the Church. This is a completely new guide, full of interesting pictures of the Church, and likely to be of interest to visitors and to residents. It has been published by the recently re-launched Friends of Clare and Poslingford Town Churches. Our Fellowship is a body of people united by our commitment to serving Jesus and making him known. We are about a hundred people coming from all different denominations and experiences. As well as the usual church activities, we run lively and thriving youth clubs on a Friday night for ages 5-14. 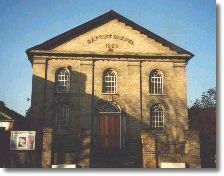 The United Reformed Church is situated in Nethergate Street. Known to many of the locals as "the Chapel" it is and has been an important part of worship in Clare. This can be seen not only within it's own framework but also the Church enjoys playing an active part in "Churches Together in Clare". The URC at Clare shares it's Minister, Rev David Dones, with the URC at Wickhambrook. The regular Sunday worship at 10.30am is led by David and other visiting Ministers, lay preachers and friends. A small but lively Junior Church takes place at the same time as the Service with the Children joining the congregation towards the end. They are very much a valued part of our Church Family. Bible Study and Prayer Groups meet on a monthly basis. A warm welcome is offered to all who wish to visit and "listen in" to any part of the URC 's life. The Clare Priory Chapel is situated in the grounds of Clare Priory.